A second take on the last of a generation. In the end, this looks good, performs well, and hits the price nail right on the head. Ahh, Coffee Lake, what a life you’ve had. Whether it was a response to Ryzen or not, there’s no denying that Intel produced some true gems out of that architecture. The quad-cored Core i3-8100 and the hex-cored Core i5-8400, to name just two, are incredible value propositions that we adored. For anyone looking to build a cost effective PC, these are prime parts, perfect for a super-nippy office machine or better-geared gaming rig. Couple that with the well-equipped Z370 chipset, and the generation as a whole is far from being dead in the water. But as we’ve seen time and time again, the effect your mobo of choice has on performance is often less than 5 percent, if that. 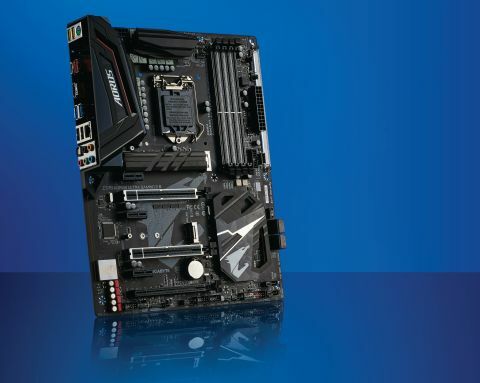 When it comes to deciding exactly which mobo you want to pair with your processor kingpin, the decision process inevitably comes down to three factors: What form factor do you want, what connectivity do you need, and which manufacturer do you prefer? Gigabyte’s Z370 Aorus Ultra Gaming 2.0 is a revision of one of its more popular mid-to-high-end line-ups, the Ultra Gaming. Packing a clean look, plenty of connectivity, and solid dependable performance with an affordable price tag, it’s a product that’s well placed to hold on to substantial market share, and is a perfect choice for anyone looking to build a mid-range Core i3 or i5 machine. Compared to the basic Ultra Gaming, the 2.0 features an M.2 PCIe SSD heatsink as standard, and a new 11-phase power design, which helps reduce coil whine when overclocked or under heavy load. One downside of this shift, however, is that you do lose out on the integrated DVI-I support in the rear I/O. Which is a bit odd, as it’s replaced by nothing at all. That said, it’s a decent, well-rounded upgrade to the platform, especially if you’re looking at utilizing an unlocked K-series part. Want a different form-factor, or just to check out the competition? Here's our guide to the best gaming motherboards. Right then, let’s talk performance. What are we looking at here? The Gaming 2.0 is a bit of anomaly in our testing suite, especially when it comes to power draw. We’ve commented in the past about how Asus’s mobos typically have optimizations in the BIOS that both boost the V-Core and improve performance in Cinebench R15 and GeekBench. It ultimately leads to higher scores in those benchmarks (around 9 percent). However, on the flip side, the trade-offs usually extend to a CPU temperature increase of about six or seven degrees Celsius and, of course, a far higher power draw. The Ultra Gaming 2.0, on the other hand, scores lower in the benchmarks, thanks to its stock configuration, but you do gain those lower running temps, lower power draw, and an overall quieter rig, even without the grunt of Asus’s fan profile tech behind it. As far as overclocking is concerned, we still couldn’t push our Core i7-8700K past 5.2GHz, but it did manage that fairly effortlessly, and the coil whine wasn’t overly noticeable. One thing we would love to see, however, is a far better BIOS than Gigabyte currently offers. It does the job, but the overall layout and access to information is limited at best, and it tends to look a little dated compared to that of the competition. All that said, the Gigabyte Ultra Gaming 2.0 is a finely balanced motherboard, with enough guts and fun to support anyone looking at investing in a well-rounded Coffee Lake system. If you’re happy to tinker around with a slight overclock to your chip, you can easily match the performance of the Asus competition without much trouble. In the end, it looks good, performs well, and hits the price nail right on the head.